Or, for 40 bucks you could imitate Johnny Lee and build one out of a Wii Remote. Take your pick. this thing is mad reactive, I saw it in person and its totally responsive. 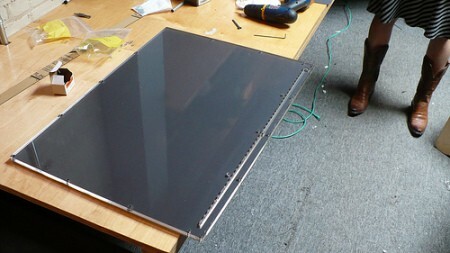 http://www.nuigroup.com/forums , it’s a community for multitouch displays , you cand find guides on how to make one of these for less than 200$ and it’s way more responsive. They are using FTIR with no composite surface , DI and Laser Light Plane tehnique are way more responsive. response is a has a lot to do with the camera setup and software involved as well. To say “this screen method is way more responsive than that screen method” is a bit overhyping. the quality of ir illumination within the screen will certainly affect performance, but to evaluate the responsiveness of the *screen itself* is a a gross misrepresentation of the technology. a lot like saying that the fat wing on the back makes my car go faster. I love this song. One of my all time Favs. Much like the Wii remote, I don’t see multi-touch very interesting beyond a tech demo… I move most efficiently with my fingers across the keyboard, I can be more productive using the keyboard as opposed to a mouse because the movements are smaller and more direct. why would I want to replace minute direct finger movements with using both my arms to do the same work? I can see some use for it in particular applications, if you’re doing photo work or maybe 3D work (though a SpaceBall for 3D is even better than this IMO) but for web browsing, sending documents and emails, even for video games… 90% of the things people use computers for I don’t see any benefit to multi-touch over a keyboard and mouse. I guess I don’t understand why people are swooning for this stuff. Multi touch displays are mostly about the shiny new tech aspect. I have to admit that they are cool but I think if I had one then the cool, fun part would soon wear off and I’d be wondering why I’d spent all my cash on something I’m hardly going to use. Well if I had one it would seem really useful as a control panel for a home-automation system. Like I could use it to display and control the status of all the lights and vents and door locks in my house. I guess I could do that with a regular touchscreen too, but I’d think a 60 inch multitouch that could be used for that and as a television (hey, it’s just a regular projector, right?) would be more worth the cost than a 60 inch capacitive touchscreen, assuming they make such things. It also seems like a multitouch would come in handy for presentations, like showing guests my photography. Or schematics. Or I could just use it to fulfill my fantasy of giving a bunch of elite assault storm troopers a pre-mission briefing.